If there is one part of web navigation that modern browsers grossly underestimate it is arrays of links embedded in every single site. Clicking links is as old as browsers themselves and is terribly limited in some situations. 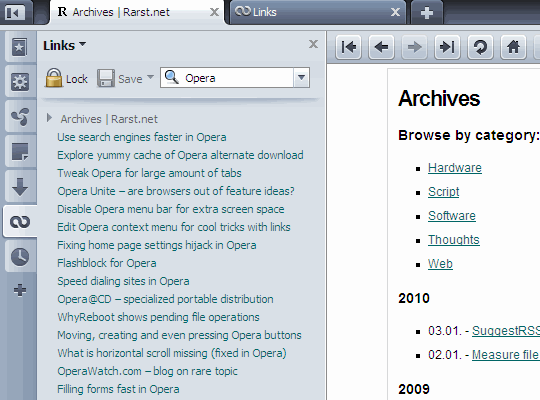 Opera includes special Links page and sidebar panel that makes it much easier to work with link-heavy pages. Links page can be opened from main menu Tools > Links or with Ctrl+Shift+L hotkey. Links sidebar panel can be enabled, as rest of optional panels, using plus button there. Both page and panel do same thing – make thorough index of all links from current/last toggled page. title attribute is used if present. There is highly useful incremental search box. It searches both through links anchors and actual links. It is convenient way to find specific link but major time saver when you need to filter multiply links to some site or specific file type (torrent, ahem :). Lock button can freeze current search results so they are preserved if you close or navigate away from page. Even more important than finding links it is ability to open multiply links in bulk. to select range of links click first with Ctrl and then click last with Shift. copy list of links (useful for external download managers). The only downside here is that it could do even more. :) Support for more complex searches would be especially useful. Unfortunately Links is very underknown feature and hardly sees any media attention at all. I don’t think it got any attention or improvements for quite a few Opera versions. Links function is one of the things Opera is so good at – breaking out of the box. Excellent tool to make highly annoying bulk link operations a breeze. It would be nice if Firefox had this option. For managing links in Firefox I use couple of add-ons but none of them can do all of this, and not to mention that having too many add-ons slows down the browser. I don’t think I’ve seen any other browser or extension that provides similar link panel. That is what I like about Opera – it has plenty of original features, relying on primarily on own developments instead of mix of common browser experience. You can press the ‘,’ key to search links. Though it searches only anchors , it seems. I had covered that in post on search features in Opera. I much prefer link panel to search links – more convenient and bulk open is awesome.